These were very simple and sooo delish! I found this recipe when I was searching Pinterest:) and knew I had to make them right away. See all those beautiful layers?? Love!! 2. Mix the melted butter and graham cracker crumbs until thoroughly combined. Press the mixture into the bottom of the prepared pan. Bake in preheated oven for 6 minutes. Remove pan to a cooling rack. Leave your oven on while you prepare the dough. 4. In the bowl of a stand mixer fitted with the paddle attachment or in a large bowl with an electric mixer cream together the cream cheese and sugar until smooth. Mix in the egg and vanilla on low speed just until incorporated. Pour the cheesecake batter into the prepared crust. 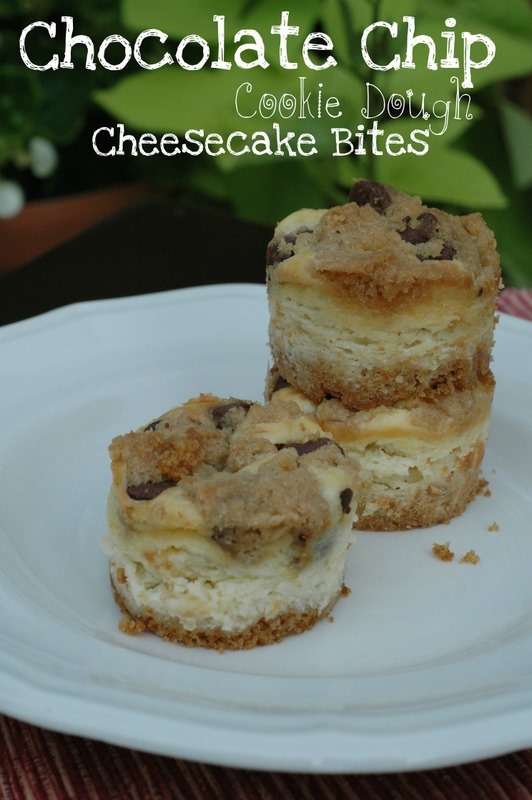 Using your hand to form clumps, distribute the cookie dough onto the top of the cheesecake batter in teaspoon-sized clumps. Be sure to use all of the dough. 5. Bake for about 30 minutes, until the top feels dry and firm (the cookie dough) and the entire pan looks set if given a gentle shake. Move bars to a cooling rack and allow to cool completely. Chill in refrigerator overnight or for at least a couple hours. 6. Lift the bars out by the overhang and cut into squares for serving.